FinancialSpreads, the London based spread betting and contracts for difference (CFD) company, has cut the spread size on four key markets. Earlier this year, the company gave clients new trading options by adding more than 2,500 CFD markets to the FinancialSpreads platform. This also meant that clients could trade both the CFDs and spread betting markets from one account. The company has now tightened its pricing on a number of important global markets. After the FTSE 100 and euro/dollar, the US based 'Wall Street' index is normally the most popular market with FinancialSpreads' clients. The company has now introduced tighter spreads for their most popular US stock market indices and crude oil markets. According to Adam Jepsen, spokesman for FinancialSpreads, the new cuts have helped to reduce the cost of trading for investors. 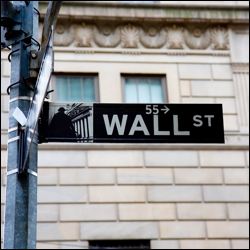 "We already offer one point spreads on the FTSE 100 and the euro/dollar market so it's great for clients that we now offer one point spreads on the Wall Street index. "We don't charge any commissions or broker's fees on either spread betting or CFDs. Our charges are priced into the width of the spread itself. Therefore, the tighter the spreads, the lower the cost of trading is for our clients. "We haven't stopped with the Wall Street index though. A lot of investors trade the S&P 500 index as well as the Brent crude oil and US crude oil markets, so we've cut the spreads on those markets too"
With financial spread betting and CFD trading, tight spreads are important. A tight spread means that a market does not have to move as much before a trade can be closed for a profit. Investors should note that even with tight spreads, spread betting and CFD trading are leveraged and therefore they still carry a high level of risk to your capital. Investors should ensure spread betting and CFD trading meet your investment objectives. Seek independent financial advice if you do not understand the risks. FinancialSpreads offers a commission-free trading service where clients can trade over the phone or via www.financialspreads.com on more than 2,500 spread betting and CFD markets. There are professional level charts for every market and many markets like the FTSE 100, euro/dollar, gold and US crude oil can be traded 24 hours a day, from Sunday evening to Friday evening. 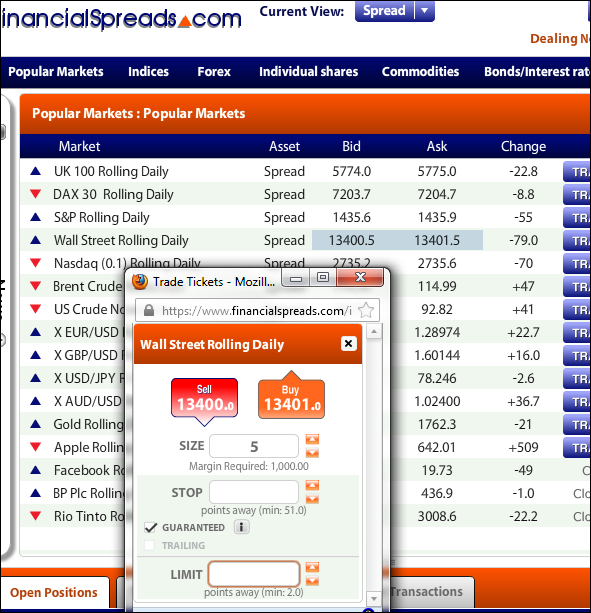 Clients can trade across a broad range of shares, forex, commodities, treasuries and indices on financialspreads.com. They can also use risk management orders such as Guaranteed Stops. FinancialSpreads is a trading name of London Capital Group Ltd (LCG) which is authorised and regulated by the Financial Conduct Authority. LCG is a company registered in England and Wales under registered number: 3218125. Registered address, 2nd Floor, 6 Devonshire Square, London, EC2M 4AB. The information and comments provided herein under no circumstances are to be considered an offer or solicitation to invest. Nothing herein should be construed as investment advice. The information provided is believed to be accurate at the date the information is produced. ‡ Spreads may vary outside market hours and in extreme conditions. Spreads fixed from January-July 2012. Please note - as of 14 Sept 2015, Financial Spreads is a trading name of Clear Investor Ltd. which is an appointed representative of FINSA Europe Ltd., company no: 07073413. FINSA Europe Ltd. is authorised and regulated by the Financial Conduct Authority, registered number 525164. Registered Address: 9th Floor, 30 Crown Place, London, EC2A 4ES, UK. As well as seeking a more robust level of regulation, and the extra due diligence that comes with, Financial Spreads took the opportunity to carry out a complete platform upgrade...» read more. With polls showing a 50:50 split between the 'Yes' camp (Independence) and the 'No' camp (Better Together), the financial markets have become increasingly nervous...» read more. Since April, FinancialSpreads has been offering clients a grey market which is based on Alibaba's market capitalisation at the end of its first day of trading on the New York Stock Exchange...» read more. The Nonfarm Payroll data is often the most closely watched economic release in a given month because it is a strong indicator of how America, the world's largest economy, is performing...» read more. FinancialSpreads, a UK multi-asset trading firm, have fixed their spread betting and CFD markets for the last two years...» read more. FinancialSpreads.com has added two new differential markets to make it simpler and more cost effective for investors to trade the relative performance of the global stock markets...» read more. Investors can now review heat maps for a wide range of financial markets via the FinancialSpreads.com Research and Data section...» read more.